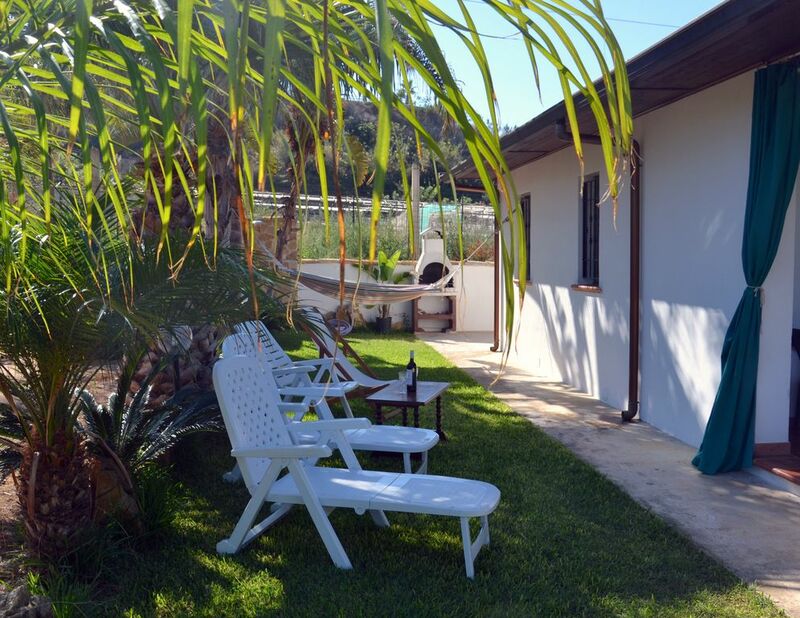 Villa Solemare Verde is very comfortable with two bedrooms and a sofa- bed, a large bathroom with shower, a kitchen complete with everything you need for cooking. In addition, integrated the living room with TV (SAT-TV international). The house is supplied with air conditioning and Internet WI-FI. The entrance area is equipped with patio and with a sitting area. The house is surrounded by a garden with exotic plants, 4 long chairs invite you to sunbathe, it should be too warm, you can always take a shower in the garden with natural well water, in addition stands for a nice barbecue a large grill. You can park your car on a private area close to the house. The house is nestled among olive groves, lemon trees, palm trees and a green garden, there is a playground for the children at your disposal, and the entire property is fenced. The Villa Solemare is located in a very quiet location, but also it is located in the cultural heart of the Gulf of Castellammare. Villa Solemare is very comfortable with two bedrooms and a sofa- bed, a large bathroom with shower, a kitchen complete with everything you need for cooking. In addition, integrated the living room with TV (SAT-TV international). The house is supplied with air conditioning and Internet WI-FI. The entrance area is equipped with patio and with a sitting area. The house is surrounded by a garden with exotic plants, 4 long chairs invite you to sunbathe, it should be too warm, you can always take a shower in the garden with natural well water, in addition stands for a nice barbecue a large grill. You can park your car on a private area close to the house. The house is nestled among olive groves, lemon trees, palm trees and a green garden, there is a playground for the children at your disposal, and the entire property is fenced. The Villa Solemare is located in a very quiet location, but also it is located in the cultural heart of the Gulf of Castellammare. For air condition cold-warm is on consumption for a cost of 0,30 € per kw/h. For air condition cold-warm is on consumption for a cost of 0,30 per kw/h. Balestrate (approx. 5000 inhabitants) has not yet been overwhelmed by mass tourism, meaning you can still enjoy its typical Sicilian flair. Hospitality and friendliness to children are part of the way of life here. Sun, sea and kilometres of clean sandy beaches, some with child-friendly lidos all go to make up an unforgettable holiday experience. Balestrate is in close proximity to the motorway system (about 2 km away), meaning the most famous sights of Sicily are in easy reach (e.g. Palermo 25 minutes, Aetna about 3 hours). The bus and rail routes to such places as Taormina, Agricento, Segesta etc. are also ideal. Cycle and car hire are available locally. Since Balestrate lies in the proximity of the motorway (approx. 2 km removed), the most beautiful and most famous objects of interest can be achieved by Sicily shortly (e.g. Palermo 25 minutes, Ätna approx. 3 hour). In addition, bus and railway connections after e.g. Taormina, Agricento, Segesta etc. are ideal. Der Mietpreis beinhaltet die Bettwäsche, Handtücher, Wasser, Strom , Gas, wifi free. Die Klimaanlage kalt-warm wird auf Verbrauch berechnet, 0,30€ pro Kw/h. The rental price includes bed linen, towels, water, electricity , gas, wifi free. The air conditioning cold-hot is calculated on consumption, 0,30 € per Kw / h. Le prix de location comprend le linge de lit, serviettes, eau, électricité , gaz, wifi free. L'air conditionné froid-chaud est calculée sur la consommation, 0,30 € par Kw / h. Il prezzo include la biancheria da letto, asciugamani, acqua, luce , gas , wifi free. L'aria condizionata freddo-caldo è calcolata sul consumo, 0,30 € per Kw / h.